The District Health And Family Walfare Samiti, North 24 Parganas, Is Looking Forward For Eligible People To Various Contractual Post. So Interested Are Requested To Submit Their Offline Application Form Within The Given Time Period. 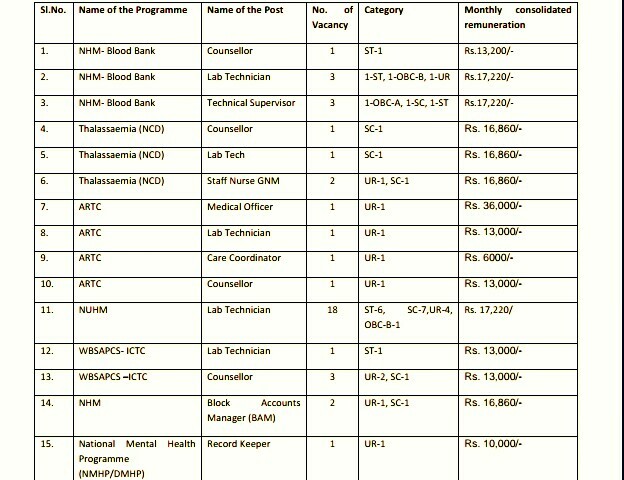 Various Contractual Posts →40 Vacancies, Kindly Go Through The Image Below For Vacancies Distribution, Name Of The Programme/Posts And Remuneration. B. Eligible Criteria For DHFWS Recruitment 2019 North 24 Parganas. Age Limit →Minimum 18 Years And 60 Years Is Maximum And There's Is Age Relaxation As Per Government Rules. Educational Qualifications →Do Check Out The Official Advertisement. Mode Of Examination/Selection Process →Selection Is Based On DHFWS Selection Rules. Offline Application/Examination Fee →Candidate must submit the Application Fee of Rs. 100 /- (Rs. 50/- in case of reserved category) for the above mentioned posts, through cash deposit in any branch of Bank of India in favour of “District Health &Family Welfare Samiti”, A/c number- 424210100036711, IFSC code- BKID0004242, Barasat Branch. How To Apply →Application should reach to Office of the Chief Medical Officer of Health, Banamalipore, Barasat, North 24 Parganas, PIN-700124 within 5 th April, 2019 by 5:00 P.M. through registered post or speed post only and duly mentioned “post applied for” in front of the envelope. No application will be considered after stipulated date and time. Click Here To Download The Official Advertisement/Notification.